We’re getting out of the weather so your livestock can, too. We’ve been spending our weekends building loafing sheds in our shop, and we’re confident that our sheds are some of the toughest money can buy. We sell the sheds customized, built to your exact size and color specifications. 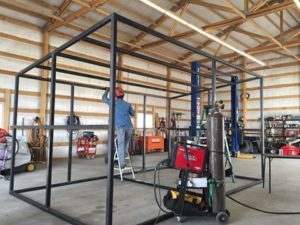 We are able to build them any length by hauling in pieces and welding them together on-site. For legal hauling purposes, we can only build sheds 10-feet in depth. If you’d like to arrange your own delivery, we’ll build them as wide as you’d like. If you’d like to save some money, we can build the frame and you can side the shed as you like. Frame only runs $10 per square foot. Finished shed runs $22.50 per square foot. Delivery charges vary based on location. We line the shed halfway up with plywood, and if requested can coat the plywood with used motor oil if you’ve got an animal who would find plywood tasty. If you have a large property and need multiple sheds, we will negotiate a discounted price. We’re building these on nights and weekends when we aren’t on the job somewhere, so do let us know if you need one to get on the list. There’s a three-day turn around generally on them, give or take a few days depending on what else we have going. Give us a call to discuss your needs: 970-443-4059. We’ve spent a considerable amount of time in Wellington, Colo., with Leachman Cattle of Colorado at their bull facility. It’s amazing to see the work they’re doing breeding top quality Angus cattle. 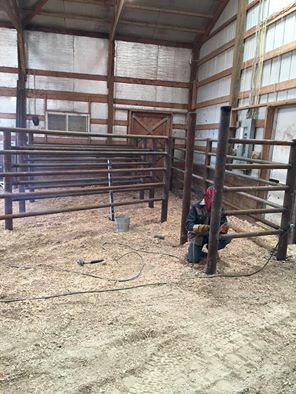 We helped to improve their facility with better breeding chutes for bull collection. We turned an old sale ring into a labyrinth of pipe that will improve the efficiency of the facility by leaps and bounds, and we look forward to the work we have on the books for them going forward.